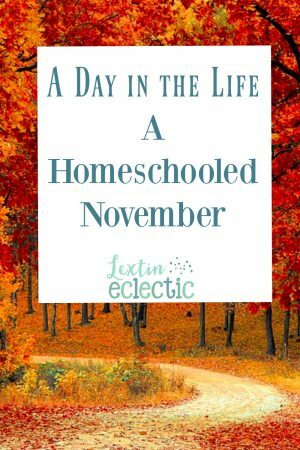 Would you like a glimpse into our homeschool life and daily routine? Let me recap a fairly typical Monday in our homeschool. 5:45 AM – I stumble out of bed and put on some fuzzy socks to go with my pj’s. I head to the basement with a cup of hot tea. 6:00 AM – One child gets up – not very cheerfully I might add…. (we rotate who has early morning school with Mom – Monday and Tuesday it’s Curly, Wednesday it’s Tiger, and Thursday it’s Bee). 6:05 AM – After choosing a scented oil for our diffuser Curly and I begin our school day with workbooks for geography and grammar as well as logic. Then we read poetry and do our Bible lesson together. 6:30 AM – We move on to spelling, grammar, Latin, and Spanish. 7:00 AM – We do a writing lesson and then finish with math. I make her a list of all the work she needs to complete independently. 7:25 AM – Curly begins some of her independent work while I run upstairs to wake Bee. In these moments I have deep sadness that our house has two flights of stairs. 7:35 AM – Bee grumpily comes downstairs to join Curly. Bee and I do her workbooks and then do a reading and spelling lesson. 8:10 AM – We all go upstairs for breakfast and find that the little girls are awake, as is Tiger. They are destroying the upstairs as they play. We eat breakfast and review AWANA verses. 8:40 AM – I finish my breakfast while the kids go upstairs to brush teeth and make beds. 9:15 AM – Tiger starts his piano practice (and does his daily chore of unloading the dishwasher) while Curly and Bee read together. I have some school time with Punkin while Ladybug joins us. Punkin chooses to practice cutting with scissors and then we play with her ponies. 9:30 AM – I read with Ladybug and then do her reading and math lesson. Several ponies join us for our learning time and we talk in weird high voices while we discuss shapes. Tiger reads with Curly while Bee goes upstairs to practice her piano. Bee also does her daily chore of folding laundry. 10:00 AM – The little girls sit on the floor and build castles with blocks while I finish school with Bee. We do her grammar and math lesson. Tiger joins us at the table to do his handwriting and a math facts page. 10:20 AM – I do Spanish with Tiger and Bee and then we do a science lesson. They sit on the floor and throw a bouncy ball back and forth while we practice Spanish vocabulary. Curly reads with Ladybug while Punkin listens in. 10:50 – AM – I do all of Tiger’s school with him – workbooks, reading, spelling, grammar, and math. Curly practices her piano (and starts more laundry) and Bee does some of her homework. After piano Curly comes to the school table to finish her independent work. 11:40 AM – We do a short history reading and a Bible lesson all together. Punkin always makes this time…..interesting. 12:10 PM – I go upstairs to get lunch ready while Curly helps Tiger and Bee with a math page. The little girls play and look at books while the big kids do some math. 12:20 PM – We sit down to lunch and watch a history lesson online. 12:55 PM – The kids clean up the table while I do dishes. 1:05 PM – The girls finish folding laundry (and put it away) while I read to Tiger. 1:40 PM – Tiger puts dishes away while I read to Curly. 2:10 PM – The kids go to the basement to play with Legos while I get on the treadmill. 3:05 PM – I shower after my workout while the kids continue to play. They now have out Legos, Playmobil, wooden blocks, the wooden castle, play kitchen items, and dollhouses. 3:30 PM – I take a short break to check my emails and catch up on a few things online. 4:00 PM – I start dinner and do more dishes while the kids do a few chores. Tiger and Curly play with the little girls. Or maybe more accurately, they boss the little girls around during playtime. 5:25 PM – I give Tiger a piano lesson while the girls play together – and without too much screaming! 6:05 PM – We sit down to dinner together and watch a Salsa Spanish episode online. 6:35 PM – After dinner the kids clear the table and wipe it down while I do dishes. Then they go upstairs to take showers while I make muffins for breakfast. 7:45 PM – I tuck in the little girls who are especially cranky. I had planned to read Christmas books with them but both are crying on the floor. So I give up and opt for bedtime instead. 8:00 PM – The big kids enjoy some quiet time in their rooms with audio books while I finish picking up. Their iPods have been the best investment ever! 8:20 PM – I collapse in a chair while I wait for my hubby to return home (he teaches an evening class and doesn’t get home until late on Monday evenings). So you can see that I rotate working with my kids so I have a chance to spend time individually with each one. Also, Curly has been a huge help this year by reading to the younger kids and listening to them read their readers to her. Without her help as a listener and reader, I would not be able to get as many things done! Thankfully, Curly is also able to do some of her work independently now. This also saves time for me as she can work at the table with us as I school one of her siblings. This homeschool thing is slowly getting a little bit easier! However, the topics I teach are much more challenging (hello decimals and percents!). And no, the times are not all exact. A few of them might be 5 or even 15 minutes off. But they are fairly good estimates of a typical day in our homeschool. I don’t spend all day watching the clock. Our days have a fairly predictable rhythm and routine that is working well so far this year. I’m glad we survived Monday! It was one long, long day! I LOVE seeing the schedules of other homeschoolers. I can't believe how early you start! I think I need to get our day started earlier like you guys. If I could just get itself out of bed. Instead I wait for my baby to wake up at 7 to drag myself out of bed. 😊 looks like a nice schedule. Thanks! The early start time seemed a little challenging at first but now it's wonderful. We get so much done in the early morning quiet and I enjoy some individual time with my older kids. It's so much easier to teach without the interruptions and we love having some afternoon free time once most of our school is done.